We're excited to announce a company-wide migration to an all-digital platform beginning with the Winter 2013 issue of Renew Magazine. Since its founding in Fall 2009, Renew Media — including Renew Magazine, RenewEveryDay.com and the newly-launched Renew Treatment Finder at http://Treatment.RenewEveryDay.com — has operated with a singular goal of creating and distributing meaningful and inspirational recovery-focused content. It’s also of utmost importance to make all content easily available to everyone who needs it. By transitioning to a fully-digital format, Renew is able to distribute content to a broader audience more quickly, at a lower subscription cost for readers and with new enriched and interactive content. Click here to subscribe to Renew Digital or view a free preview of the Winter 2013 issue. 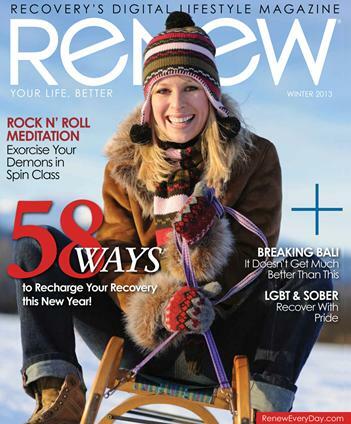 “Moving the magazine to an all-online format means we have so many more opportunities to do great things in the recovery community,” says Jim Moorhead, Renew Media president and publisher who is in recovery himself. “It means more people will have access to recovery news, support and information. We aim to be a resource for those already in recovery, people supporting loved ones, or anyone attempting to gain recovery. Current subscribers to Renew can look forward to an easy transition to the new format, which will include four larger, fully-shareable digital editions a year; access to Renew’s complete archive and an additional year added to their current subscription, free of charge. If you are a current Renew subscriber, click here to get all the info you need for the digital improvements. The economic and environmental benefits of an all-digital format also mean significant savings for current and future subscribers, with a new yearly subscription cost of only $15.95 — nearly $10 in savings. Many other outlets in the media world are also choosing to go the route of all-digital because they and their readers, too, understand the benefits. Renew recognizes the impact addiction has on the lives of everyone it touches and the need for trustworthy and accessible information. By moving its content to an all-digital platform, Renew looks forward to developing a lasting archive of recovery information and inspiration that can be shared with those who need it, when they need it.